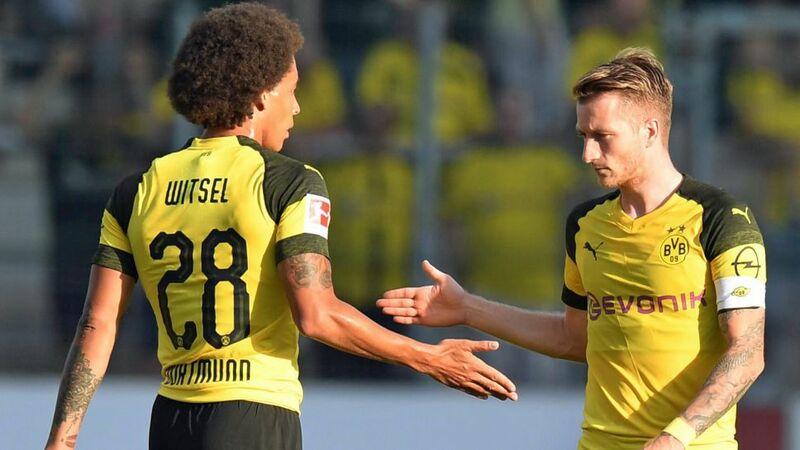 Borussia Dortmund will be an entirely different proposition with Axel Witsel and Thomas Delaney holding down the centre of midfield in 2018/19, according to newly anointed club captain Marco Reus. FIFA World Cup bronze medalist Witsel, 29, and Denmark international Delaney, 26, have been brought in from Tianjin Quanjian and Werder Bremen respectively during the summer transfer window. The duo have yet to partner up in Dortmund colours, but are widely expected to form a new, no-nonsense pairing at the heart of the midfield. "He hasn’t been here long, but he’s already made a really good impression as a person and on the pitch," Reus said of Belgium international Witsel, a domestic title winner in his homeland, Portugal and Russia. "Axel has a lot of international experience as a number six and a number eight. He radiates calmness and self-confidence - in critical situations, too. Axel showed what he can do at the World Cup. He will make us a better." Reus was similarly effusive in his praise of Delaney. The former Werder enforcer made 45 Bundesliga appearances after swapping Copenhagen for Bremen in January 2017, and started all four of Denmark's games en route to the last 16 of the 2018 World Cup in Russia. "Thomas is an exceptional kind of player," Reus told German sports specialist magazine kicker. "He’s the kind of player we’ve been missing in the past. You need a player like him in the niggly games. He sweeps up and gets the game going again in the other direction. Thomas can be a really important player." Reus, 29, also expects the ideas and influence of new head coach Lucien Favre to play a telling role following last season’s fourth-placed Bundesliga finish. Favre is about to embark on his third Bundesliga voyage following spells in charge of Hertha Berlin and Borussia Mönchengladbach. Reus, who played under Favre for 11 months at Gladbach before returning to boyhood club BVB in summer 2012, is convinced the former Nice boss is the right man for the job. "He’s always been a top bloke," Reus explained. "Of course, he’s evolved as a coach - it’d be pretty bad if he hadn’t in the last six years (laughs). He’s developed. Pre-season is different to playing Bundesliga, Champions League and DFB Cup football, but his attention to detail will be good for us at the business end when little things are so decisive. We’ve still got time to take on board his instructions, but we’re definitely on the right path."